Imagine a market Nirvana for digital offerings. Think beyond the traditional value exchange processes and protocols and re-envision how buyers and sellers might interact in a world with a networked marketplace. 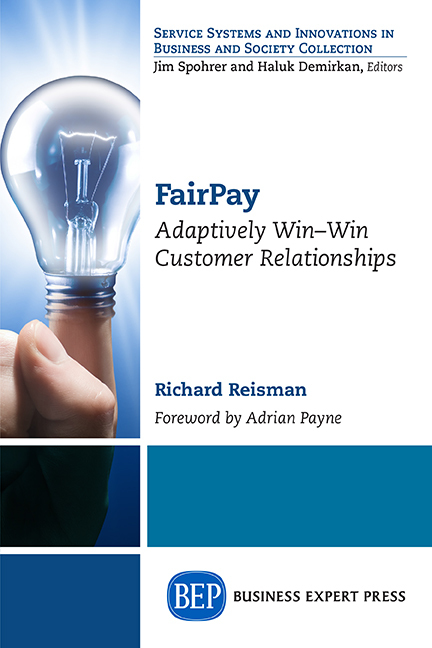 I suggest FairPay offers the path to that market Nirvana, and that it is now very practical. Here is an overview (based on the recent rework of the FairPay home page). Of course free is even more ideal (for the buyer alone), but we know there is no free lunch -- someone pays. The question is how to make the market work for the consumer, and still motivate sellers to sell and creators to create. "Fair Pay What You Want" (as just described in the box) clearly comes rather close to a practical ideal for a large mass of consumers. Ordinary "Pay What You Want" pricing has been shown to work well for special offers. ...With FairPay (short for "Fair Pay What You Want"), every offer is a special offer. 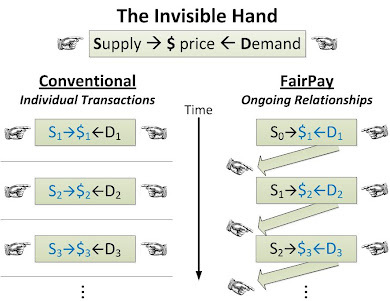 FairPay changes the game from single transactions to an ongoing relationship of continuing transactions. That enables a whole new balancing dynamic that drives to a better market equilibrium, over a wide range of relationships and value perceptions. 1. Selectively offer to let the buyer set any price the buyer considers fair -- after the sale (Fair Pay What You Want, post-sale). 2. Track that price and determine whether the seller agrees that is fair, and use that information to let the seller decide whether to make further offers of that kind to that buyer in the future. I suggest this gets us as close as possible to market Nirvana. The buyer always pays a price he considers fair, and seller gets to sell to every buyer who set prices fairly (in the seller's judgment). The seller is also able to limit his risk, in way that trades a managed level of small loses for a large expansion of his market to the entire population who value his offering. Some will pay better than others, but for all who pay fairly, the seller gains revenue. And for those who the seller judges to not pay fairly, FairPay offers are restricted, and conventional set-price selling remains the fallback. 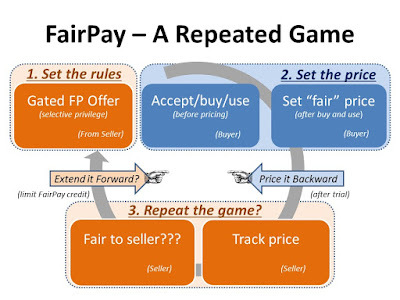 Thus FairPay exploits the power of the networked marketplace to offer as a participative pricing process that combines the user freedom of pay-what-you-want pricing, with a new level of feedback, accountability, and seller control of future offers to make it fair to both buyers and sellers. For more on how that works, see the FairPay site (How Does FairPay Work? ), and many of the posts on this blog. EFF has posted a nice summary, observing that "While the record labels, movie studios, and video game producers have not figured out a way to compete with free, others have...as the Humble Bundle has shown us, it is possible, with creators and distributors finding new and exciting ways to compete with free. ... when done right – developers, content providers, and even those who provide the business model can successfully compete with free." Additional details are in a Wikipedia entry. My previous post, How Indies Can Disrupt the Disruptor - A Disruptive Revenue Model for Music and Games, addresses this in more detail -- suggesting how indie distributors can take on iTunes to change the game, starting with the Long Tail, and moving toward the mainstream.